New York Magazine of Mysteries, The. Health-Happiness-Prosperity / Containing the Mysteries of: Dreams, and their meaning Glorified Visions, Occult Powers, Astrology, Magnetism Hypnotism, Psychology, Telepathy, Psychometry, Clairvoyance, Graphology, Palmistry, Hidden Powers, Etc. / The Cheer-Up Magazine. 1/1, 1901-26/9, July 1914. 16 -32 pp. (largely advertising, plus numerous supplemental pages devoted solely to the advertisements). $1.00 a year, ten cents a copy-25 cents a year, 5 cents a copy. 9x13, 32-52 pp. (varies). 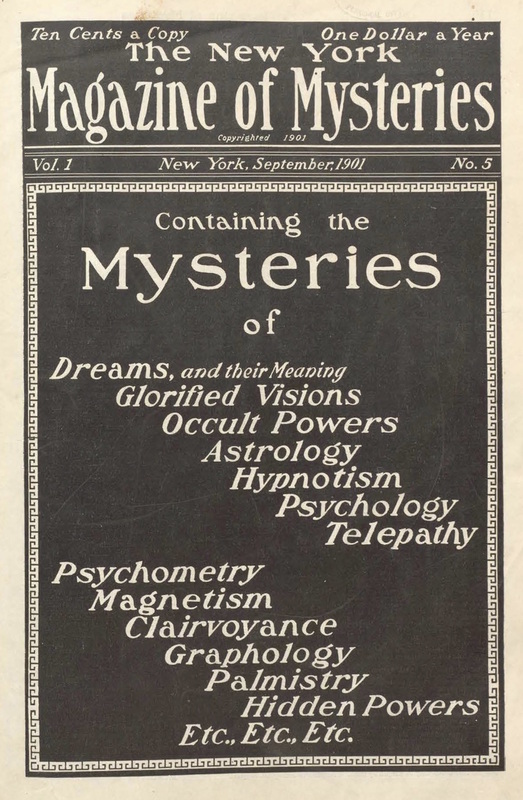 The advertisement for this in The Progressive Thinker, June 22, 1901, claimed that the journal "contains the Mysteries of Dreams and Their Meaning, Glorified Visions, Occult Powers, Astrology, Hypnotism, Psychology, Telepathy, Psychometry, Magnetism, Soul Charming, Clairvoyance, Modern Spiritualism, Graphology, Palmistry, Unseen Powers, Mental Healing, etc." While the journal initially did not carry advertisements (and gloried in that fact), it eventually became a prime example of the power and profitability of advertisement and definitely subordinated content to advertising. It carried regular columns by the likes of Helen Van Anderson, Frederic W. Burry, and W.J. Colville and occasional notices from William Walker Atkinson, but these were mere window-dressing for the magazine's own "Mystic Success Club" ("Health, Wealth, a Long, Useful and Blissful Career for Years") which sold pins that functioned as talismans and had a series of degrees through which candidates progressed-all for $1.50 a year. (Its Second Degree of the Mystic Success Club: Receptivity, Second Step to Success ([New York? ]: New York Magazine of Mysteries, c.1903) survives, marked on its title page "Sacredly Confidential.") The journal also advertised (and seems to have sponsored) The Universal Brotherhood of Ancient Mystic Adepts, also known as the Holy Seven, who emerged from the seclusion of the ages to reveal wisdom to the readers of the journal. Both of these organizations were the brainchildren of Helen Van Anderson, a novelist, feminist and New Thought lecturer, and Hubert A. Knight, who reorganized the Order of the Illuminati of Leopold Engel and Theodor Reuss in the United States in 1902. Besides this, the journal carried advertisements for various occult secrets by William E. Towne (the husband of Elizabeth Towne, the founder and editor of The Nautilus), Dr. T.J. Betiero (see the notes under The Philomathian and Betiero's Oriental Mysteries), the purveyors of "Pahlavi Cards," and others of the same ilk, and reams of notices for increasing one's height, curing baldness, losing or gaining weight, learning law at home, palmistry, mail-order schemes, developing thought force or personal magnetism, etc. A major interest of the journal in those halcyon days before the securities laws, was in touting the stock of the Magazine of Mysteries Association, Inc., advertised at $10.00 a share, and promising a sixteen percent dividend annually coupled with a money-back guarantee on the price of the shares! "Start the Year Right" (January 1902): 143. To support this promise, the association's president, Charles E. Ellis, claimed a circulation of more than 150,000 a year, with paid subscriptions in the first 10 months of 1904 of more than 116,000. Through October 1904, the journal said it made more than $220,000 in subscriptions and $57,000 in advertising revenue. Ellis came to a bad end after he overextended himself in a separate scheme-a building-material (Kornit) made of animal hooves and horns-and was convicted, in 1910, of mail fraud. The journal was not the same thereafter and in its last years was most entirely an advertising vehicle, priced at 25 cents a year, carelessly produced, and containing filler of general interest with only rote discussions of the "mysteries" ("Hidden Powers," "Have We Lived Before," "Dreams and their Meaning," etc.) by the likes of "Brother Servator" (who established his bona fides by mentioning his "boyhood in India") and other unknowns. NYPL; LOC; NY State Library; University of California, Santa Barbara; University of Texas, Austin.